Ben has over a decade experience in all kinds of comedy including stand-up, sketch, storytelling and improvising. He got his start in the 1999 Melbourne University Comedy Revue, and started performing solo comedy in 2004. Ben has developed a smart, friendly and accessible style, with reviewers calling him ‘geek comedy’s patron saint’ (T-Squat), ‘a confident and affable performer who radiates warmth and inclusiveness’ (Squirrel Comedy) and ‘no Carol Vorderman to look at, but considerably funnier’ (Herald-Sun). His created the “Man in the Lab Coat”, a series of shows combining comedy and science at Australian festivals, for National Science Week, and as part of ensemble The Peer Revue. He also created the Melbourne Museum Comedy Tour, which ran for five years during Comedy Festival, and has appeared at science storytelling night The Laborastory, revealing the histories of his heroes Mary Anning and Hedy Lamarr. Other comedy performances include Ben McKenzie is Uncool, playful gameshow Your Turn (with Pop Up Playground), hit Channel 31 variety show Planet Nerd, and +1 Sword with Richard McKenzie. 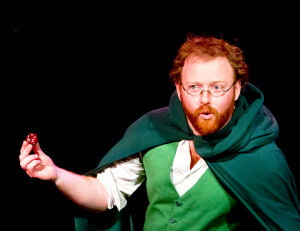 He and Richard also collaborated on Dungeon Crawl, an improvised Dungeons & Dragons adventure show featuring Melbourne’s top comedy talent as guests, which ran for five years. Ben was co-host of the hit Doctor Who podcast Splendid Chaps, and plans to return to podcasting in 2016.